In 1814, the Congress of Vienna has just begun. Diplomats battle over a new map of Europe, actors vie for a chance at glory, and aristocrats and royals from across the continent come together to celebrate the downfall of Napoleon…among them Lady Caroline Wyndham, a wealthy English widow. 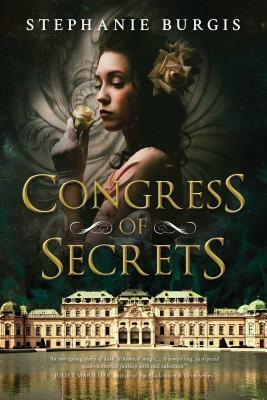 But Caroline has a secret: she was born Karolina Vogl, daughter of a radical Viennese printer. When her father was arrested by the secret police, Caroline's childhood was stolen from her by dark alchemy. Under a new name and nationality, she returns to Vienna determined to save her father even if she has to resort to the same alchemy that nearly broke her before. But she isn’t expecting to meet her father's old apprentice, Michael Steinhüller, now a charming con man in the middle of his riskiest scheme ever. The sinister forces that shattered Caroline's childhood still rule Vienna behind a glittering façade of balls and salons, Michael’s plan is fraught with danger, and both of their disguises are more fragile than they realize. What price will they pay to the darkness if either of them is to survive? Stephanie Burgis is the author of Masks and Shadows. She has published over thirty short stories for adults. Kat, Incorrigible (US)/A Most Improper Magick (UK) won the Waverton Good Read Children's Award in 2011 for Best Début Children's Novel by a British writer. It was followed by Renegade Magic/A Tangle of Magicks and Stolen Magic/A Reckless Magick. Born in Michigan, she now lives in Wales with her husband, writer Patrick Samphire, and their children. Before becoming a fulltime writer, she studied music history as a Fulbright Scholar in Vienna, Austria, and worked as a website editor for a British opera company. "Intense, vivid, and romantic. A compelling story of intrigue and dark magic in a richly drawn historical setting. Recommended!" "A keen sense of adventure and a sparkling wit combine to make Burgis among the best in the business. She's my go-to writer for pure delight." "A brilliant historical fantasy brimming with glowing historical detail. I hugely enjoyed this delightful novel’s deft interweaving of intrigue, alchemy, and romance, and I can’t wait to see what Stephanie Burgis writes next."